From your Web Content Dashboard, click the button for My Coupons. You’ll be taken to a grid with a roster of your Coupons. You can sort, search and customize this grid (link to grid section) just like other WTD grids. To create a new Coupon, make sure the correct resort is displayed in the grey bar above the grid next to the box that says “Choose Resort.” Use the dropdown to change resorts, if necessary. In the box that says “Choose Item” select Coupons. 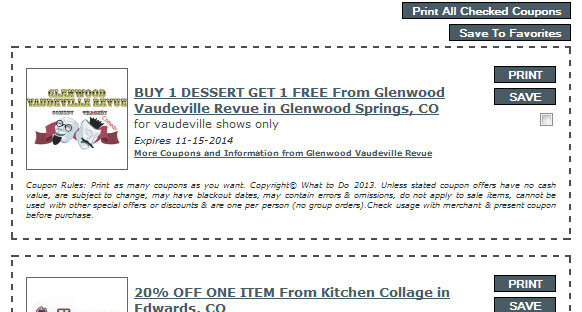 Type your “Coupon Title” and select dates on the calendar as the Start Date and Expire Date for the coupon. A NOTE ON TITLES: Correct format: First Letter of Each Important Word Capitalized. • Put the most important info first because the title may be truncated for size considerations. • Do not use all capital letters, all lower case letters or intentional misspellings unless that is a recognizable characteristic of your brand. Click the “Create New” button. A new, mostly blank form will open up for you to fill out. Optional Coupon Code – If you have a system for tracking promotions you may may write the code here. Locations and Phone Numbers – Every Coupon MUST have at least one Active Location or the listing WILL NOT appear on the live website. The Location that appears automatically in this box is based on the info in your Business Profile. If this is the correct Location for the Coupon, simply make sure the box at the far left of the Location is green and says “Active.” If the box is red and says “Inactive,” click it and it will change status. A new popup box will appear. You will need to “Select a Location” from the dropdown. This is a specific area/neighborhood/town within your resort area. Then enter the street address. City, state and zip will be generated automatically on the form. If the location that appears is correct but contains an error, click on the “Edit” icon (the yellow square with the pencil image) on the right side of this field. Category with Subcategory – A Coupon may have UP TO FIVE Categorizations but needs AT LEAST one to appear live on the WhatToDo network. More on Categories & Subcategories. When you have filled out the form completely, click the “View Coupon” button at either the top or the bottom of the form to preview how the Coupon will appear to potential customers on the WhatToDo network. Once you’ve edited and previewed your Coupon, click the “Active” button to publish it. If you want to add a logo, click the “Next” button at either the top or bottom of this form to determine what logos appear with this Coupon. NOTE: Because of size restrictions for Coupons, Logos are the only media that may be included, Please upload a hi-resolution print Quality logo for coupons when possible. Even though they appear online, customers will need to print them in order to present them, so Coupon logo files must be .eps, .pdf, .jpg, .tiff or native files from Adobe Illustrator (.ai) or PhotoShop (.psd). Must fit into an area that is 2.25” x 1.5” @ 300dpi or higher. However the media gallery functions the same way here as it does in other aspects of the WTD Admin. * The best Coupons are very simple, with as few words as possible. An Event is a specific activity or occurrence with a finite beginning and end time that has some type of entertainment value. A Special is a promotional offer (usually some kind of cost reduction or discount) that takes place on or during a period of time. While these two items have separate definitions, they function exactly the same in the Admin. 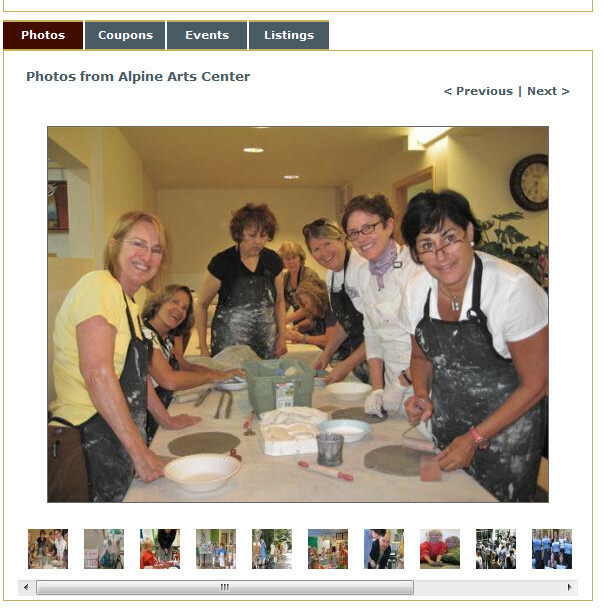 In the Web Admin you can either create a new Event/Special or edit an existing Event/Special. Log in to your account at http://admin.whattodo.info/. You will be taken to a new page that lists all your Events/ Specials on a grid. Use this grid like you would use any in the WTD system (General Directions). In the gray bar at the top center of the page there is a place to “Choose Resort” from the drop-down menu. Choose the resort AREA in which your Event/Special takes place (or is closest to). Please Remember, they must be placed in the area where they occur or they will not appear in the WhatToDo network. Next to that, the drop-down says “Choose Item.” Confirm that this is set to “Events” or “Specials,” depending on the correct classification for the item you’re entering. Click the button for “New Item” (in the center of the gray bar in the center of the page). A popup box will open with 4 blank fields and a calendar. Next to “Select Event/Special Type” hit the down arrow at the end of the field to select the Event/Special Type that MOST CLOSELY relates to your Event/Special – it may not be an exact description. 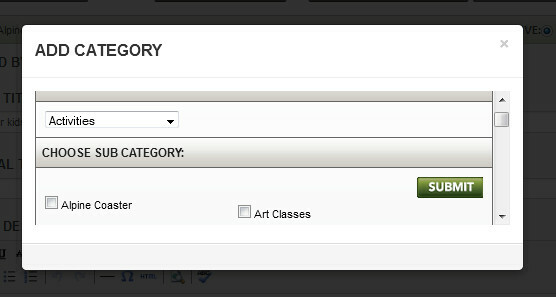 Also, you will have the opportunity to add additional Types and categories later in this process. Type in your “Event Title” or “Special Title.” Correct format: First Letter of Each Important Word Capitalized. * Keep the title as short as possible. Select Event Date or the start date of the Special by clicking the correct day on the calendar. Do not type the date. A new screen will open up with a mostly blank form. It should already include: Event/Special Title, Website, Phone Number and Email based on your business profile. (If any of this info is incorrect, you may correct it by clicking the “My Businesses” button from your Web Dashboard.) You also may overwrite it if, for example, you want to direct traffic to a separate event website instead of your home website. NOTE: All new Events/Specials will automatically show up as “Inactive.” This means that you can work on it all you want and no one will be able to see it until you publish it on the live website by making it active. Optional Tag Line – your “hook.” It gives the basic info about your Event/Special and tries to generate enough interest that readers will continue reading the full description. On the live site, it will appear like a subtitle under your Title. Event Cost – enter only a numeric value here (no need to type $) if there is a cost. Leave it blank if it’s free. Direct Link To Purchase Tickets – If there’s a separate link to purchase tickets (other than your default organization/company website listed at the top right of this form), enter it in this field. Phone/email – Confirm that the contact phone number and email are correct. (These fields are populated automatically based on your Business Profile. If these are intentionally different from your primary company contact info, feel free to overwrite them with the correct info for this specific Event/Special. The change will only affect this specific Event/Special. If they are INCORRECT, you may fix the information in your Business Profile. NOTE: Contact info IS public. It enables web visitors to contact you with questions about the Event/Special. If you don’t want this info to be public, please remove it from the fielld. Types – Under “Event/Special Type,” the box you originally selected when creating this item should show up with a check mark. If the Event/Special fits under additional Types, you may now check those as well. Please check only the Types that truly represent your Event/Special. Date/Time – Under “Dates and Times,” the Event Date or Special start date should appear automatically based on the date you originally set in the calendar. If you need to change it, you can select a new start date on the calendar that appears when you click inside the Date box. You can now set the Start and End Times for the Event or Special. If it’s an all-day event like a festival, click the bubble next to “All Day.” If the time has not been decided yet, you can choose “To Be Determined,” but please remember to update this info once the time is set. Select “Yes” or “No” for Recurring Event. Events that recur irregularly cannot be set using the Recurring option. To do this, you’ll have to fill out an Event form for the first occurrence. Once all the info is complete, click the “Copy Event” button at the top or bottom of the form, then update Date, Time and other info for the next occurrence. Every event MUST have at least one Active Location or the listing WILL NOT appear on the live website. 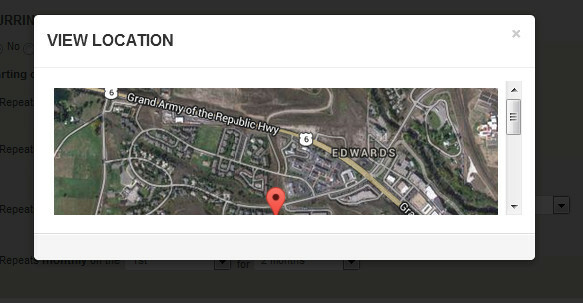 The Location that appears automatically in this box is based on the info in your Business Profile. If this is the correct Location for the Event, simply make sure the box at the far left of the Location is green and says “Active.” If the box is red and says “Inactive,” click it and it will change status. Banners are a type of online ad that appears at the top or the side of the websites in the WhatToDo network – not just on the pages specific to your company. For example, a visitor looking for kids’ activities may see your restaurant listing and make their lunch plans as well. Banner ads run for 30 days or 20,000 impressions. Buying a banner ad is your least expensive and most effective form of web advertising. To purchase a banner, click here. You may design your banner yourself or have a graphic artist design one for you. WhatToDo can be contracted to design your banner ad for an added fee of $75/hour. Once your banner meets all these specifications, send it to us at info@WhatToDo.info and we’ll upload it to your account. 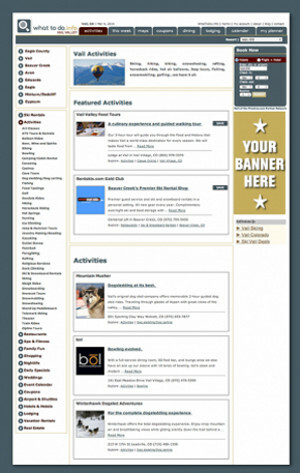 From your Web Content Dashboard, click the button for My Banners. You’ll be taken to a grid with a roster of your Banners. You can sort, search and customize this grid just like other WhatToDo grids. You can see past banners, view what’s currently on our network and analyze your visitor stats to improve future web advertising. Contact WhatToDo with any requests for changes to your banners.